Tico's fresh chips layered with melted jack and cheddar cheese and jalapeño peppers. Our Nachitos served with jalapeño peppers, sour cream, guacamole and refried beans. Three crisp corn tortillas filled with your choice of beef, refried beans, or beef and refried beans. Topped with melted cheese and jalapeños. Grilled chicken, black olives, red peppers and jalapeño cream cheese on a flatbread crust. Topped with melted jack and cheddar cheese. Large, tender mushroom caps hand-battered and fried crisp. Topped with melted cheddar cheese. Crisp corn tortillas covered with refried beans, guacamole, onions, lettuce and cheddar cheese. Topped with fresh tomatoes and our Carnivale dressing. Build Your Own! A lightly grilled tortilla stuffed with your choice of ingredients and a blend of melted jack and cheddar cheese. Served with pico de gallo and sour cream. Choose your ingredients: black olives, onions, diced green chiles, mushrooms, jalapenos, tomatoes, jalapeño cream cheese, secret sauce, black beans. Add ground beef, grilled chicken or shrimp $2.19. Tico’s classic spicy cheese dip served with fresh chips. Spicy white cheese dip served with fresh chips. The freshest avocados blended with our secret ingredients to create this classic Mexican dip. Served with fresh chips. The blend that made our Ticoritto famous: Refried beans, rice, ground beef, onions and sour cream. Served with chips. Our spicy bean dip served with fresh chips. Served with wheat pita chips. Marinated, grilled chicken breast nestled on a bed of fresh, crisp greens and topped with tomatoes, carrots, onions, broccoli, green beans, and croutons. Served with garlic toast and your choice of dressing. 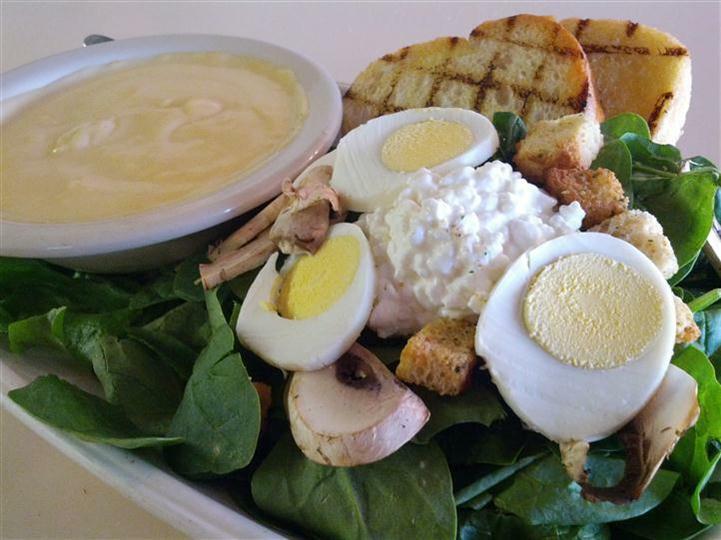 Tender spinach leaves topped with mushrooms, sliced hard boiled egg, cottage cheese, croutons and our poppyseed dressing. Served with garlic toast. 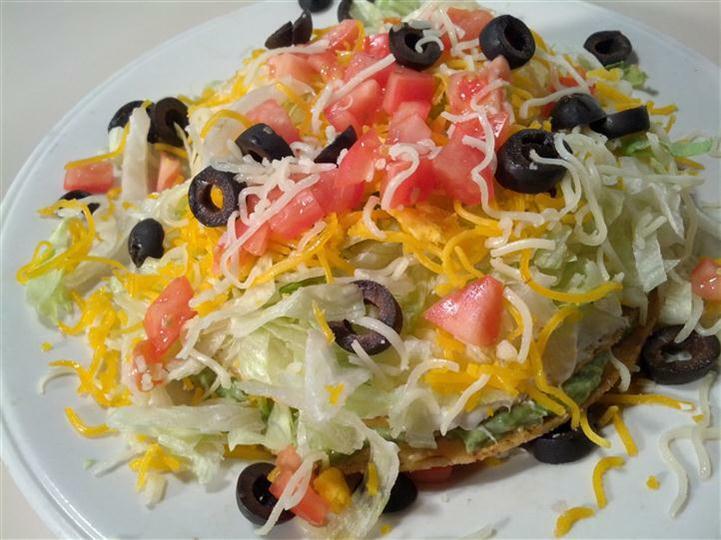 A crisp flour tortilla bowl filled with fresh salad greens, cheddar cheese, tomatoes, black olives, kidney beans and your choice of taco beef, grilled chicken, shrimp, refried beans or black beans. Served with Carnivale dressing. Crisp salad greens with red onion, tomato, green beans, bacon, cheese and croutons. Served with your choice of dressing. Freshly prepared from our original recipes. Beer Cheese, Spicy Split Pea or Soup of the Day. Two soft corn tortillas filled with chicken and Swiss cheese. Topped with a slightly spicy marinara sauce, green onions and sour cream. Two soft corn tortillas filled with a blend of seafood, cream cheese and jack cheese. Topped with a mild creole sauce and melted jack cheese. Served with garlic toast. Two soft corn tortillas filled with grilled chicken and spicy jalapeño cream cheese. Topped with vegetarian green chile, red chile sauce, melted jack and cheddar cheese and green onions. Two soft corn tortillas filled with potatoes and cheese. Topped with red chile, melted jack and cheddar cheese, green onions and sour cream. Two soft corn tortillas filled with ground beef, Swiss cheese and onions. Topped with green chile with pork, melted jack and cheddar cheese, black olives, green onions and sour cream. Soft flour tortilla filled with ground beef, rice, refried beans, onions and sour cream. 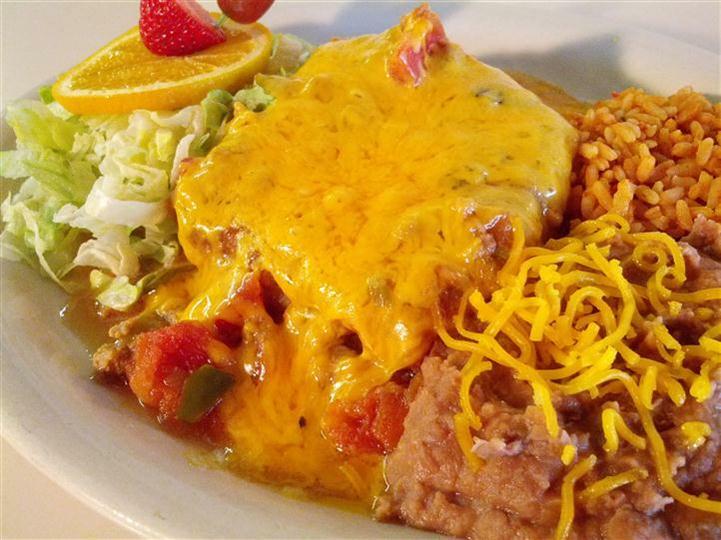 Topped with melted cheddar cheese, lettuce and choice of red chile or green chile with pork. 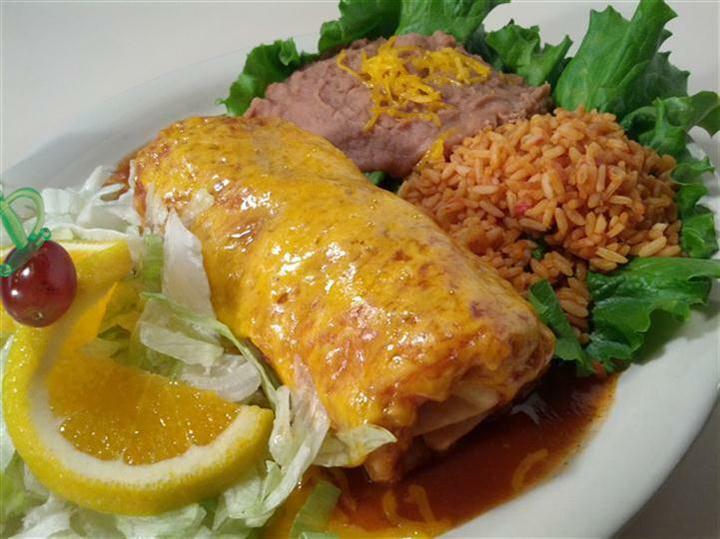 Ground beef and refried bean burrito topped with choice of red chile or green chile with pork, cheddar cheese, lettuce, onion and tomatoes. Marinated chicken breast, Swiss cheese, sour cream and onions wrapped in a flour tortilla. Served with guacamole and choice of side. Marinated steak strips, jack cheese, sour cream, green peppers and onion wrapped in a flour tortilla. Served with choice of side. 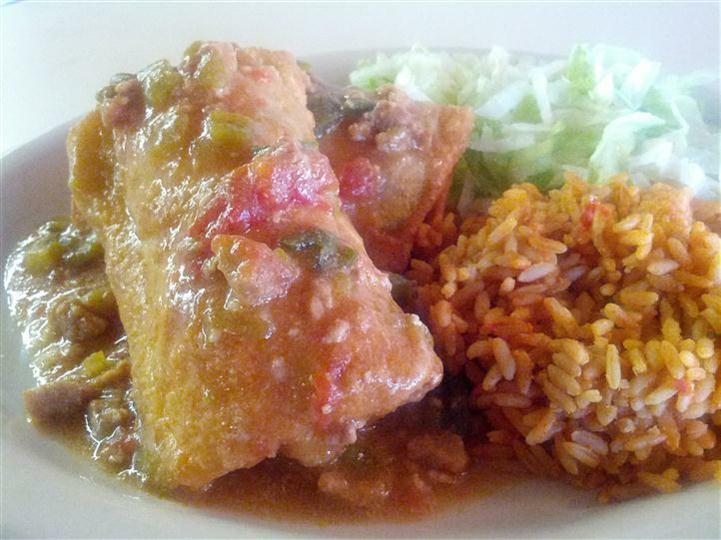 Slow cooked pork in a spicy sauce and refried beans wrapped in a flour tortilla. Topped with green chile with pork, melted cheddar cheese and sour cream. Served with choice of side. Two rellenos filled with cheddar cheese and mild chile peppers. Topped with green chile with pork. One relleno filled with chicken, Swiss cheese and fresh mushrooms. Topped with green chile with pork and sour cream. One relleno filled with chorizo sausage and fresh mushrooms. Topped with cheddar cheese and green chile with pork. 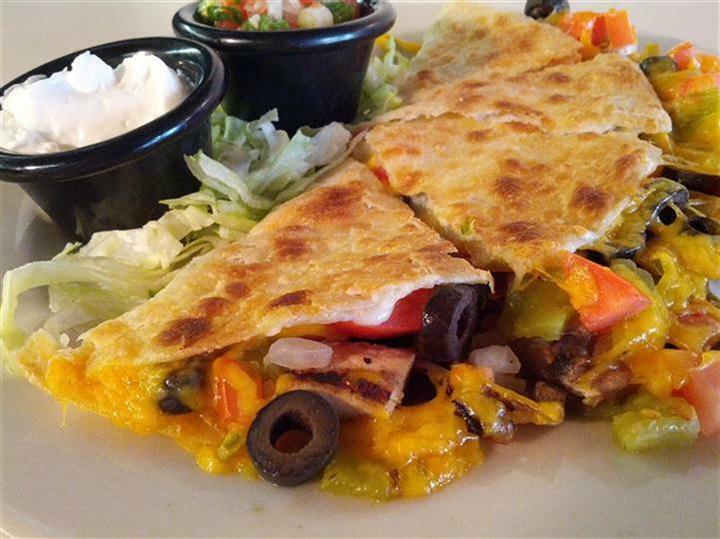 Flour tortillas layered with a mild blend of ground beef, corn, black olives, tomatoes, onions, green chiles, cheese and spices. Topped with melted jack and cheddar cheese. Served with garlic toast and choice of side. A casserole with diced, marinated chicken breast, rice, corn tortillas, green chile with pork and melted jack and cheddar cheese. Served with a flour tortilla, sour cream and refried beans. Diced potatoes in a light cheese sauce with your choice of chorizo sausage, grilled chicken or ground beef. Topped with sour cream and green onions. Served with a flour tortilla and choice of side. Many other entrees can be served vegetarian. Ask your server. Fajita-seasoned, sauteed green peppers and onions with black beans and rice inside a flour tortilla. 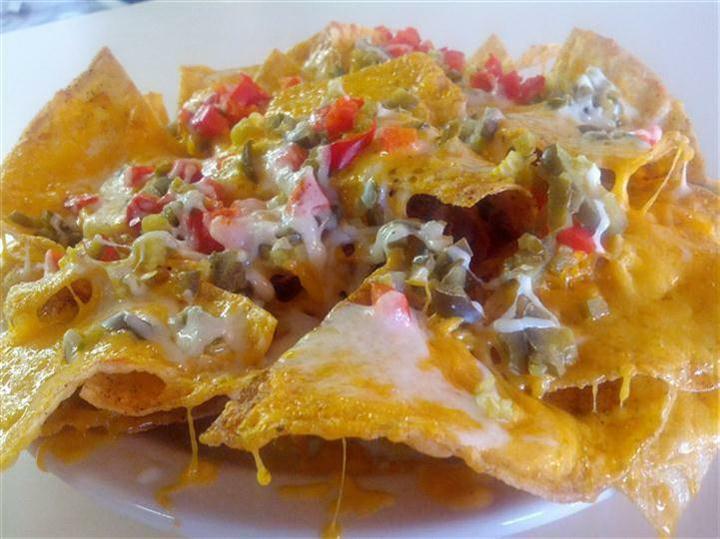 Topped with your choice of vegetarian green chile or red chile and melted jack and cheddar cheese. Served with sour cream, fresh guacamole and pico de gallo. Served with choice of side. Two soft corn tortillas filled with spinach, mushrooms and spicy cream cheese. Topped with vegetarian green chile, melted jack cheese, pesto cream and diced tomatoes. Served with choice of side. Flour tortillas layered with spinach, green peppers, mushrooms, onions, black olives and sour cream. Topped with melted jack and cheddar cheese and your choice of red chile or vegetarian green chile. A flour tortilla filled with steamed broccoli, mushrooms, green peppers, onions, celery, black olives, and tomatoes. Topped with vegetarian green chile. Crisp corn tortillas layered with jalapeño cream cheese, guacamole, lettuce, jack and cheddar cheese, tomatoes and black olives. Warm flatbread filled with steamed tomatoes, mushrooms, onions, broccoli, celery, green peppers, and black olives. Topped with vegetarian green chile and melted cheddar and jack cheese. 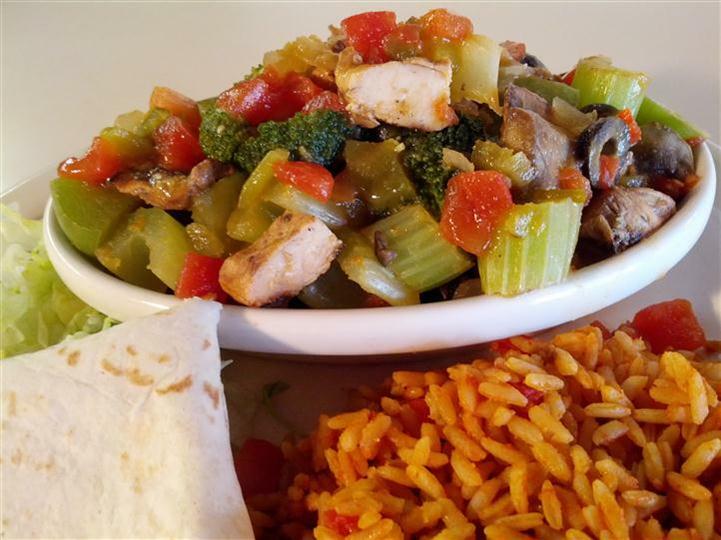 Broccoli, celery, green peppers, mushrooms, black olives, onions and tomatoes combined with our vegetarian green chile and rice. Served with a flour tortilla. Crisp flour tortillas filled with ground beef, lettuce, cheese, tomatoes and sour cream. A large, lightly fried flour taco filled with cheddar cheese, lettuce, sour cream, onion and tomato with your choice of grilled chicken, ground beef, shrimp black beans or refried beans. Two lightly fried flour tacos filled with cheddar cheese, lettuce, sour cream, onions and tomatoes with your choice of grilled chicken, ground beef, shrimp, black beans or refried beans. Battered Mahi Mahi topped with pineapple salsa, cabbage, romaine lettuce and a sriracha cream sauce. Served on flour tortillas. Slow cooked pork served on choice of flour or corn tortillas with cilantro and onion. Served with homemade hot sauce and lime wedges. A flour tortilla filled with marinated chicken and Swiss cheese, fried until crisp. Topped with sour cream, melted cheddar cheese guacamole and tomatoes. A flour tortilla filled with shredded roast beef, cream cheese and jack cheese, fried until crisp. Topped with red chile or green chile with pork. A flour tortilla filled with chicken and chorizo sausage, fried until crisp. Topped with red chile or green chile with pork and melted cheddar cheese. Steak, chicken, carnitas or shrimp on a sizzling skillet with sauteed green peppers and onions. 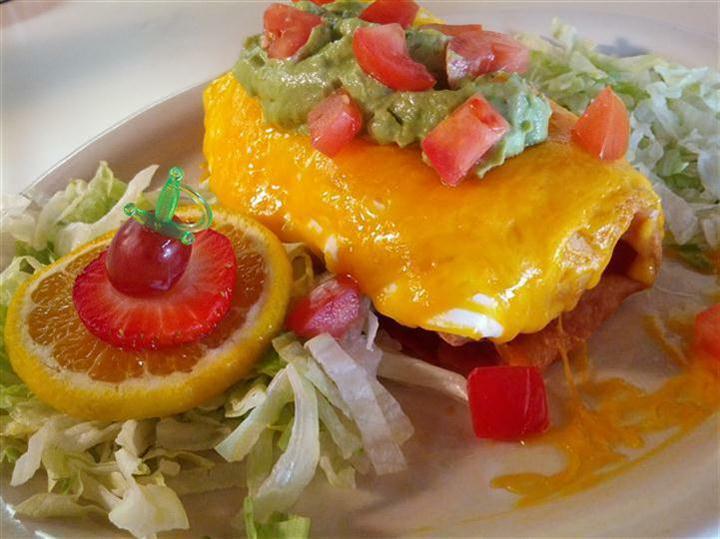 Served with fresh guacamole, sour cream, cheese, pico de gallo and warm flour tortillas. Marinated and grilled chicken breast served with lettuce, tomato and mayonnaise. A hamburger served with chile con queso, tomato, lettuce, pickles and onion. Served with tomato, lettuce, pickles and onion. A hamburger served with jalapeño cream cheese, tomato, lettuce, pickles and onion. Warm flatbread stuffed with a blend of ground beef and chorizo sausage, then smothered with green pork chile. Topped with melted jack and cheddar cheese. Thinly sliced, grilled steak with sauteed green peppers, onions, our green chile with pork and queso blanco. Served on a toasted hoagie roll. Many of our items can be served a la carte. Ask your server.